This is the same head we install on our STAGE 2 and STAGE 2 PLUS rebuilt engines. We build this cylinder head to get the most power from your engine when using your stock fuel system (EFI or carb.) The cam profile, oversize stainless steel valve design, our own custom valve springs, reatiners, machined keepers, hand machining of the ports and valve seat profile cutting have all been designed to work together for the best performance without any other modifications needed. Idle remains smooth and power is available from 1800rpm to 5000rpm. In most cases, fuel economy improves too. please note: there is a 8 week lead time on cylinder head builds. That means 8 weeks from the day you place the order until the day it ships out. If you looking for a 1981-1984 cylinder head, sorry, we cannot help you. There is not a NEW casting for the year range you are looking for. Due to the backlog of engine and cylinder head builds we have, we cannot rebuild your cylinder head. 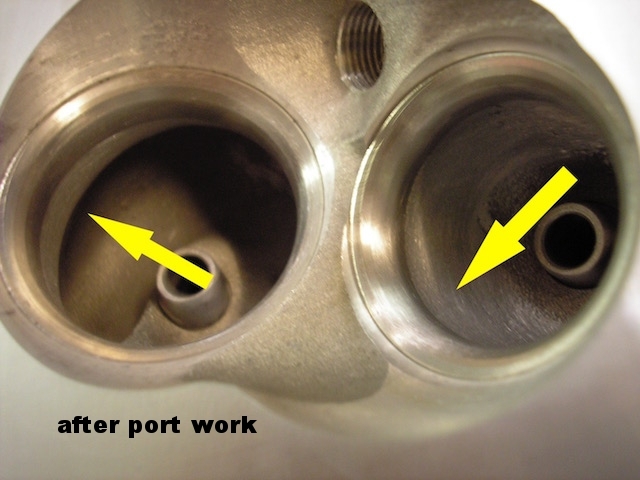 The cylinder heads shown WILL NOT INTERCHANGE to your block. Sorry, we don’t have an alternative for you.